`Kara' is the Japanese word for empty, while `te' means hand. `Do' translates as way or path. So Karate-Do can be interpreted as The Way of The Empty Hand. Karate itself is a weapon less means of defence. Karate is an Asian martial art involving blocking, kicking, punching and throwing techniques. The hard physical training required to reach a high level of skill in Karate promote overall good health, fitness and well being. The concentration, commitment and dedication required, help build a strong, confident, disciplined and determined character. Karate is also a means of developing friendship and as a self defence it is one of the most effective of all the martial arts. Karate training is structured into three main categories - Kihon, Kata and Kumite Basic techniques, set combinations and fighting. Each section has a range of complexity to suit the different levels or grades of students. Kumite will be introduced to you as basic blocking and counter attacking, but will ultimately lead you to freestyle fighting, where you will be taught to attack, and defend against unannounced attacks. Karate is by definition dangerous, it is a system of kicking and striking in order to defend oneself. However, Karate is based on respect, discipline and awareness. Lessons always begin with a full warm up to reduce any strains and muscular injuries. During classes students are closely supervised at all times and taught accordingly to their level and experience. Occasionally people can get the odd minor bump or bruise. Karate is for everyone and can be practised by men, women and children. Students can range from five years of age upwards. Anyone, who is in reasonable health, can train in Karate. Karate improves the student's health, self awareness, confidence and self esteem. Parents and teachers continually report on the improvement in behaviour and concentration of children who train regularly at the club. Everyone receives the same training although the instructor will not demand the same level of endurance. Everyone's training is with oneself and the instructor only expects the best that you can achieve. 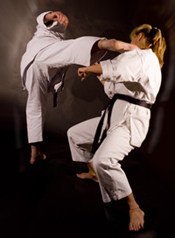 Karate is one of the most balanced and complete ways of keeping in good physical condition. Karate incorporates the use of the entire body in which legs, hips, spine, shoulders and arms are co-ordinated to develop balance, flexibility, poise, speed, strength and stamina. No other form of training uses as many parts of the body to such an extent. Karate is not seasonal and so one's condition can be maintained throughout the year. Karate becomes more interesting and rewarding as you progress, without any limit. Even after decades of training, students will still be learning and improving their techniques. HOW LONG WILL IT TAKE ME TO GET BLACK BELT? Students can take regular examinations after set periods of training. Students can generally achieve black belt standard in 4-5 years with regular and correct training. The instructors at Satori SKC, Chris Broadley (4th Dan) an experienced teacher with over 30 years of Karate history and his son Christian (3rd Dan) an experienced teacher with over 20 years of Karate history, also various instructors selected by Satori inside the organisation. Karate students train in what's known as a Gi (Karate suit). However, for your first half a dozen lessons, tracksuit bottoms and a t-shirt will suffice. I.e. loose clothing that enables free movement of your arms and legs. A Karate Gi can be purchased from the club at anytime. WHAT ARE THE CLUB'S AND ASSOCIATION'S ADVANTAGES? â�¢ Quality control through National infrastructure and emerging international affiliate program. â�¢ Nationwide Dan and Kyu gradings. â�¢ Regular access to training sessions with a team of extremely experienced senior instructors. â�¢ Regular access to training sessions with visiting Japanese instructors. â�¢ Nationally recognised qualified instructors with CRB certificates and comprehensive liability insurance. â�¢ Personal insurance and recognition governing body. Copyright (c) 2008 Satorikarate.co.uk. All rights reserved.